The new 1-series, pictured, burns up to 20 percent less fuel than the predecessor. BERLIN -- BMW AG is rolling out a bigger 1-series compact car to surpass Audi in the competition for younger customers purchasing entry-level luxury autos. The new 1 series, BMW's smallest model, is longer and wider than the outgoing model, allowing for a roomier interior and more trunk space. The vehicle's starting price will be 23,850 euros ($33,480) in Germany, 900 euros more than its predecessor. It will hit European showrooms in September. 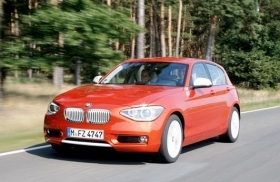 "The 1 series has considerable strategic value for BMW," said Juergen Pieper, a Frankfurt-based Bankhaus Metzler analyst. "It's the gateway" for customers in their 30s, he said. German luxury carmakers are revamping their smallest cars and adding compact models to entice buyers to sample their brands. The redesigned 1 series will compete with Audi's A3 and a rebuilt Mercedes-Benz B class coming to market this year. The 1 series will be the top seller in the western European market for luxury compact vehicles in 2011 with deliveries of 154,000, compared with 141,000 of the A3 and 81,000 of the B class, according to research firm IHS Automotive. Audi sold 173,000 of the A3 in the region last year, while BMW delivered 144,000 of the 1 series, IHS said. "We're delighted with the ability to bring new customers to the company with the development of the 1 series," sales chief Ian Robertson said at a presentation of the model in Berlin on Monday. "This car has the youngest age profile within the BMW group. It's a car that's appealing to a much broader audience, a much younger audience." Lifting sales of the 1 series is part of a broader strategy at BMW to sell more than 2 million units by 2020 and fend off advances by Audi, which aims to pass BMW as the world's largest maker of luxury vehicles by 2015. Audi has outsold Mercedes this year, claiming the No. 2 position. Audi's A3 compact, which starts at 20,950 euros, continues to benefit from "sturdy" demand and there's no definitive date yet for an overhaul, spokesman Moritz Drechsel said. The Volkswagen AG unit's original A3 was introduced in 1996 and the current second generation came to market in 2003. Daimler AG will pep up Mercedes' small-car lineup with the overhauled B class and three other new models. Mercedes is replacing the boxy A class with a sporty hatchback and is considering a small coupe and sport-utility vehicle. Mercedes is building an 800 million- euro Hungarian factory and investing 600 million euros to upgrade a German plant to expand production of the models. BMW has sold 1.22 million units of the 1 series since its 2004 introduction, with 400,000 of those deliveries in Germany, Robertson said. More than 70 percent of the vehicle's owners are new to the BMW brand, he added. The car will be shown at the Frankfurt auto show in September, Robertson said. Luxury-car makers are also boosting their compact offerings as regulators mandate vehicles with lower emissions. The new 1 series, which relies on four-cylinder engines, burns up to 20 percent less fuel than the predecessor, said Dietmar Zimmerhackl, the 1 series project leader. BMW would potentially face fines for violating CO2 emission limits without the benefit of its smallest model, Pieper said. The new 1 series emits between 114 and 137 grams per kilometer. The revamped 1 series may be the last version with rear-wheel powertrains before BMW switches to front-wheel-drive technology as part of its efforts to expand compact vehicle offerings, said Tim Schuldt, a Frankfurt-based analyst at Equinet AG. "The 1 series has an unmentionable bearing on BMW's profit margin but it certainly is a boon to their efforts to complying with fleet emission standards," Schuldt said.